The principles of the circular economy have been embedded strongly in the ethos of automotive industry for some time now. At the design stage, it is required that at least 95% of each vehicle by weight can be recovered at the end of its end of life. To facilitate effective depollution and parts dismantling, the industry created an online International Dismantling Information System (IDIS). The high metal content in vehicles, 75% on average, lends itself well to being recovered and used in new vehicle production. The remaining 20%, mainly plastics and other materials, are also reused or recovered to produce new products or energy. The industry recognises its role in increasing the amount of recycled plastic used as part of the circular economy’s plastic strategy. Further increasing the recycled content is in line with the industry’s overall environmental objectives; however, this needs to be balanced with safety and quality requirements. Since the implementation of the ELV regulations, the industry has successfully taken on the producer responsibility for vehicles reaching their end of life by establishing two vehicle collection networks,Autogreen and Cartakeback. This ensures ELVs can be handed over to an Authorised Treatment Facility (ATF) that will recycle the car in an environmentally responsible way and without any costs to the last owner. Consequently, vehicles have become one of the most recycled retail products on the market. As required by the ELV Regulation, since 2015, 95% by weight of vehicles processed by manufacturers’ recycling networks has been recycled or recovered. This represents an increase of 10% on the previous target which was introduced in 2006. The average age of ELVs (cars, LCVs and HCVs) varies depending on their purpose and it is also influenced by economic factors. The average age of scrapped cars had reached the all time low of 13 years in 2009 when the scrappage scheme took place, and it has been continuously increasing since, reaching 14.2 years in 2017. 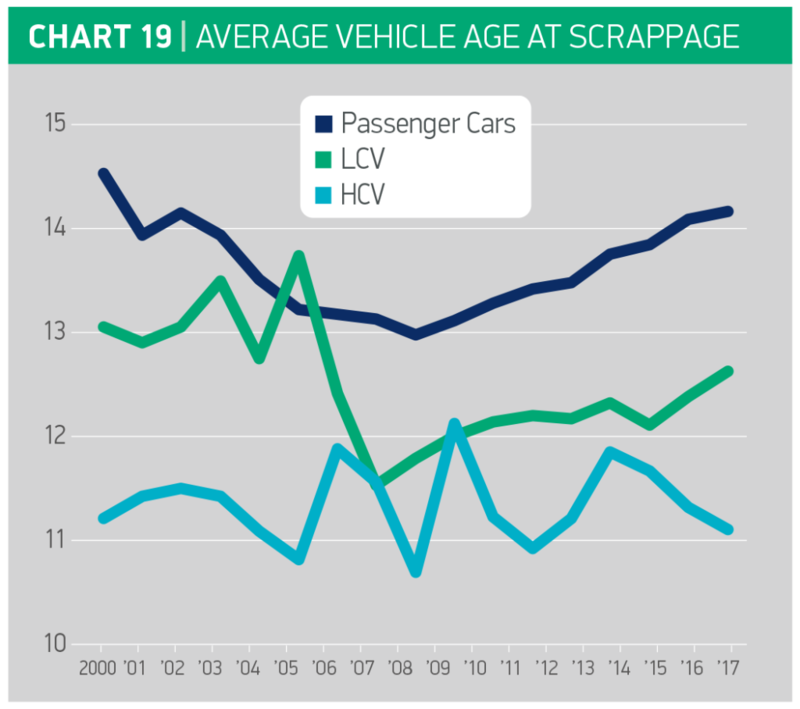 The average age of LCVs has also been increasing since 2008, from 11.5years to 12.6 in 2017 (see Chart 20, page 24). A HCV’s end of life age is very much linked to fleet replacement cycles. In 2017, the average car parc age was 7.83 years, remaining unchanged three years running. This means that vehicle replacement cycles may need to be speeded up to ensure the latest environmental and safety technologies reach the market in a timely manner. In 2017, numerous manufacturers conducted scrappage schemes of vehicles above nine years old and as a result more than 23,000 vehicles were removed between 1 August 2017 and the end of February 2018. As the uptake of AFVs increases, the carbon footprint of the use phase diminishes and the end of life stage gains increased importance. All AFV batteries can be recycled in accordance with the EU Battery Directive requirements. To extend the batteries’ useful life, in line with the circular economy principles, the industry is focusing its efforts on the reuse and remanufacture of EV batteries. When an EV battery is no longer suitable to sufficiently power a vehicle, there is still plenty of life left in it to fulfil a non-automotive purpose such as energy storage, to balance renewable energy production. A growing number of companies, including some vehicle manufacturers, use this potential for private and business purposes. EV batteries can help make the most of on-site renewable energy production, reduce electricity bills and carbon emissions, while preserving resources needed to produce new products for the same purpose. Vehicle-to-grid technologies are also expected to play an increasing role in making the UK’s electricity supply network smarter and in encouraging EV take-up. EVs that can take electricity from the grid when demand is low and return it when demand is high could help to even out peaks and troughs and make the grid more efficient.